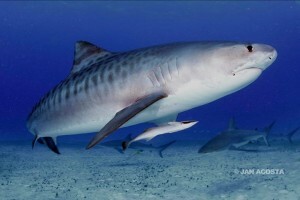 Discover the world famous ‘Tiger Beach’! 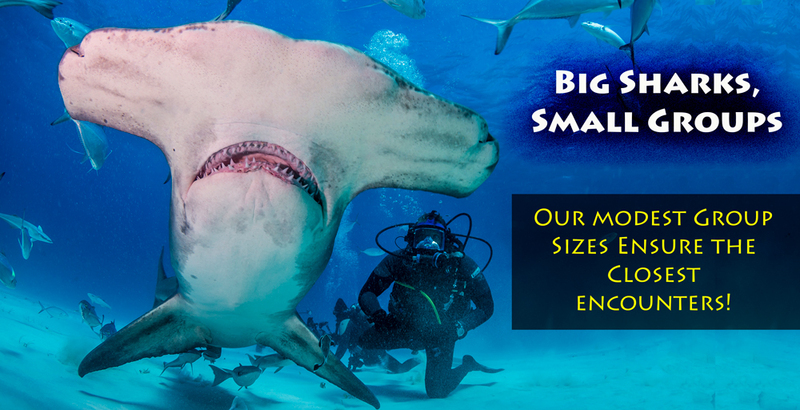 Dive up close with some of the largest sharks in the world! 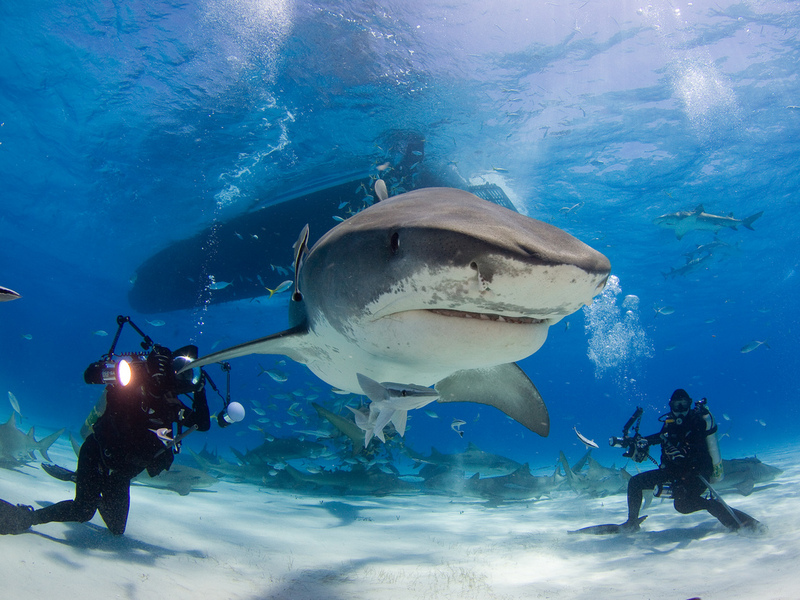 Experience tigers, hammerheads and a variety of other sharks in the clear shallow waters of the Bahamas. 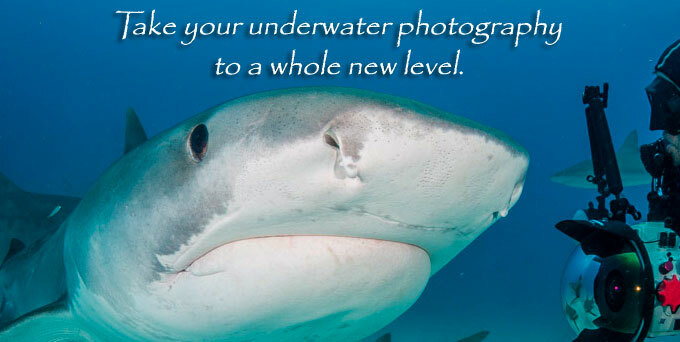 As these unique shark trips are cage-less, they are for shark enthusiasts and photographers with advanced diving experience. 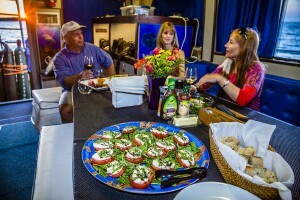 The emphasis is on getting quality in-water time and photo opportunities; space is therefore limited to a maximum of ten people. 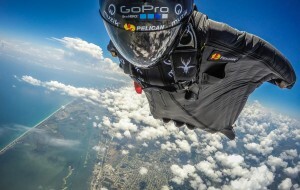 Take your diving to a whole new level of adventure! 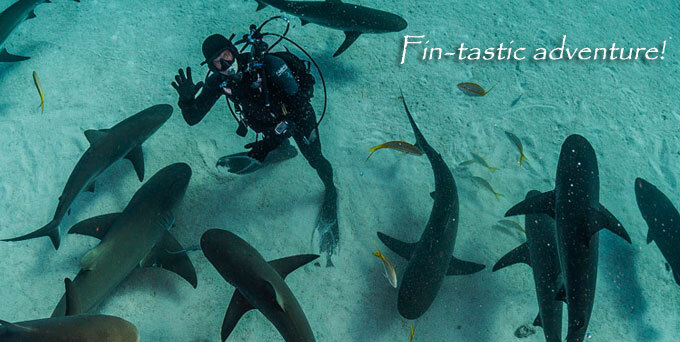 During this expedition you will have the chance to experience the thrill of drift diving with oceanic whitetips, laugh with the swimming pigs of Staniel Cay, and feel like James Bond while diving through Thunderball grotto. 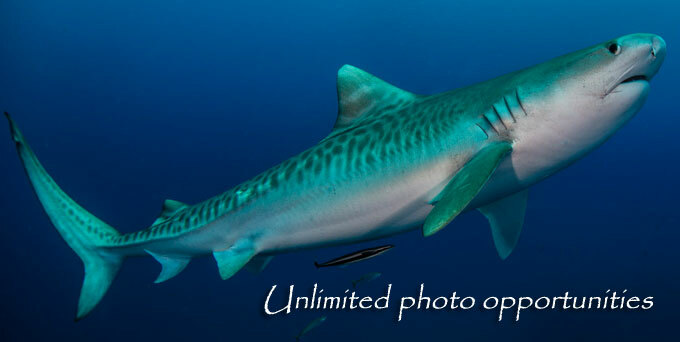 There is no mistaking the oceanic whitetip. For their commandeering presence, this impressive shark is one of a kind. 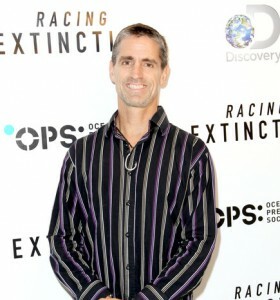 These pelagic explorers appear to spend most of their life cruising the surface area of abyssal waters. 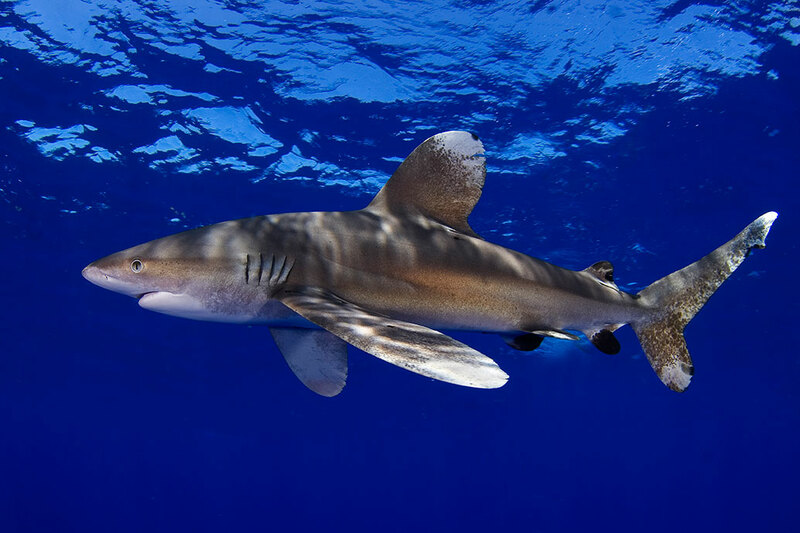 From early times these sharks have been given a bad reputation, but we are hopeful to change the way humans perceive them with our amazing Oceanic Whitetip shark excounters. In April we travel to areas in the Bahamas where we have been fortunate enough to encounter the endangered Oceanic Whitetip shark. 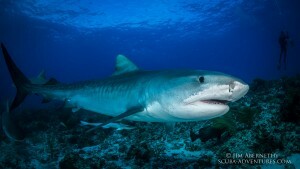 They are named because of the whitetip on their dorsal fin. 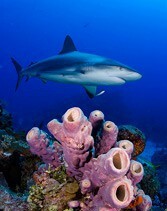 Elegant pilot fish are usually found accompanying these majestic sharks. On occasion we have even encounter juveniles no larger than 3 feet in length. With their oversized paddle-like pectoral fins you will not find a more endearing shark photograph. 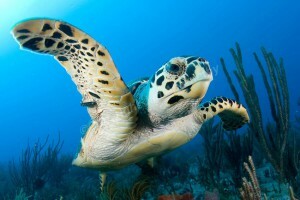 Of course no trip to the Bahamas would be complete without diving the crystal clear water and dazzling reefs. 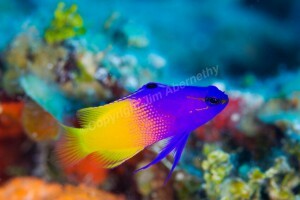 Surrounded by an abundance of marine life, both large and small, the reef’s beauty will take your breath away. 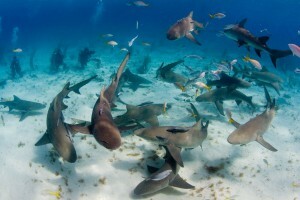 Caribbean Reef sharks, large groupers, moray eels and numerous fish will adorn a single wide angle photograph. 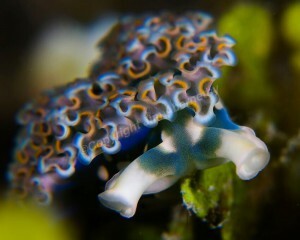 Our most popular of all trips takes divers to the world famous ‘Tiger Beach’. This spectacular location is unlike any other in the world and guarantees one of the most unique underwater experiences in a diver’s life! Imagine yourself surrounded by lemon and tiger sharks as far as the eye can see; amidst a gorgeous backdrop of crystal blue Bahamian water and powder white sand. All of this, and more, in less than 20 feet of water. 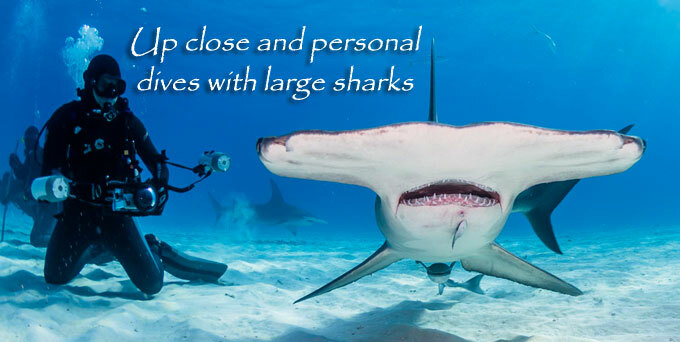 On these expeditions, our primary goal is to interact with great hammerhead sharks and tiger sharks. Great hammerheads are among the most impressive, yet rarely observed oceanic predators. 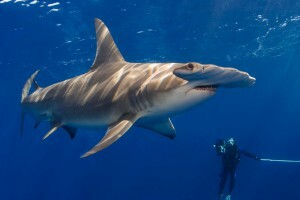 They are not to be confused with the smaller, and more common, scalloped hammerhead, which can be seen schooling in many locations around the world. 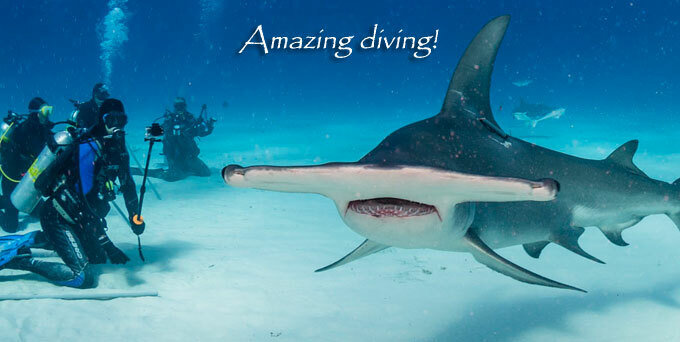 Encountering the great hammerhead – with its spectacular angularity, its orca-like dorsal fin, and its bristle-toothed mouth – is at the very pinnacle of wildlife adventure. 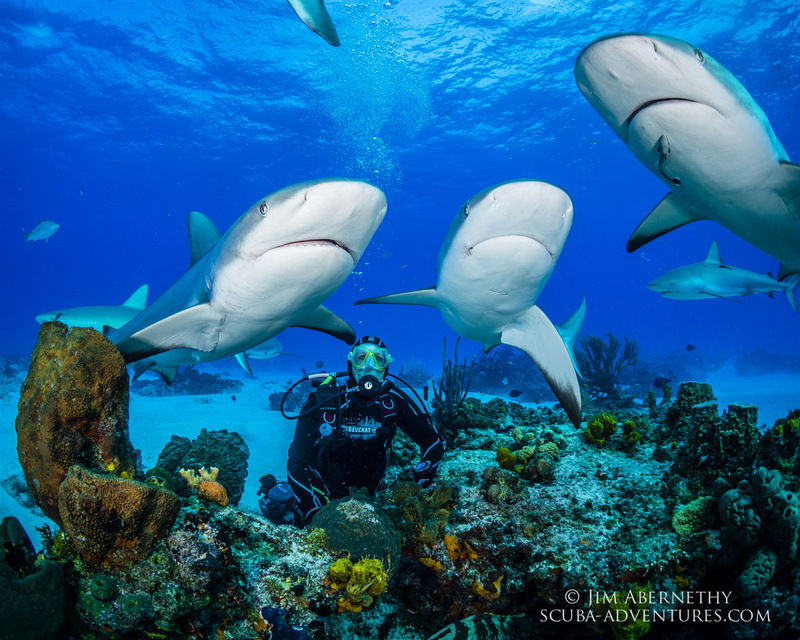 Being recognized as one of the most eco-friendly destinations in the Western Hemisphere, we are proud to support the Commonwealth of the Bahamas and their dive industry. The waters surrounding this island nation are home to one of the world’s healthiest populations of sharks, and they have acted to protect this asset for years to come. 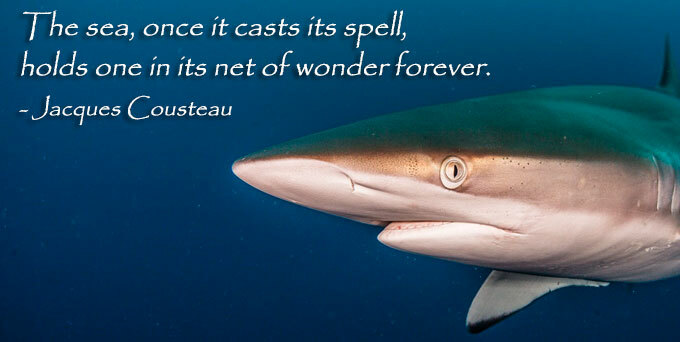 The nation remains one of the few on earth to have banned the commercial fishing of sharks, leaving the roughly 630,000 square kilometers of ocean surrounding the country as a shark sanctuary. 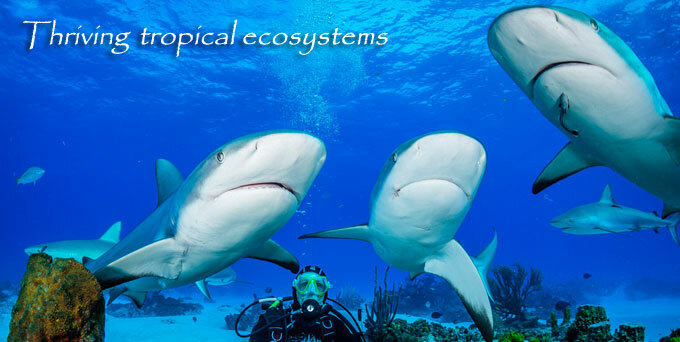 The Bahamas actively promote ecotourism; uniting conservation, communities, and sustainable travel to find long-term solutions for both economic and environmental concerns. We are honored to have operated within the Bahamas for over three decades, working to assist the nation as they strive to create a sustainable future for our oceans. 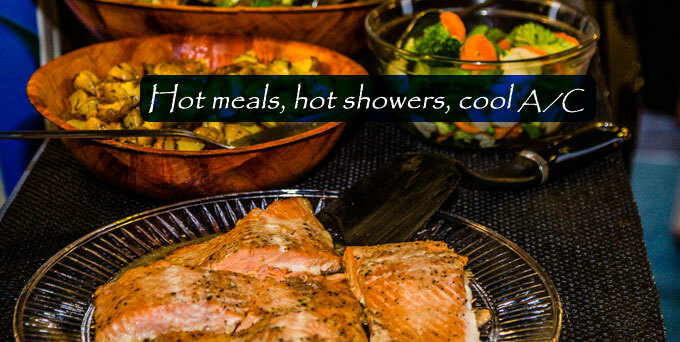 So wherever your travels may take you in the Bahamas, you can do so knowing that you are supporting a nation determined to diligently protect the natural beauty which surrounds them. 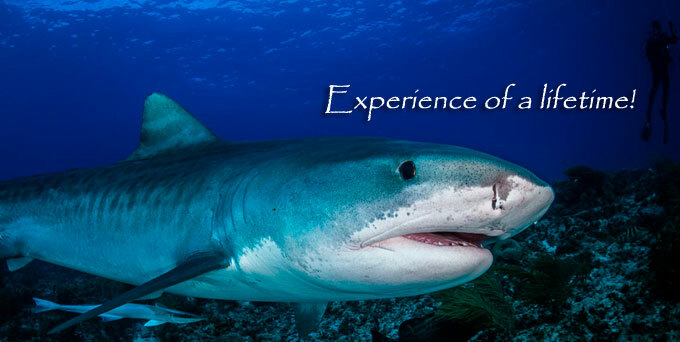 To schedule your Bahama Shark Expedition contact our team today! 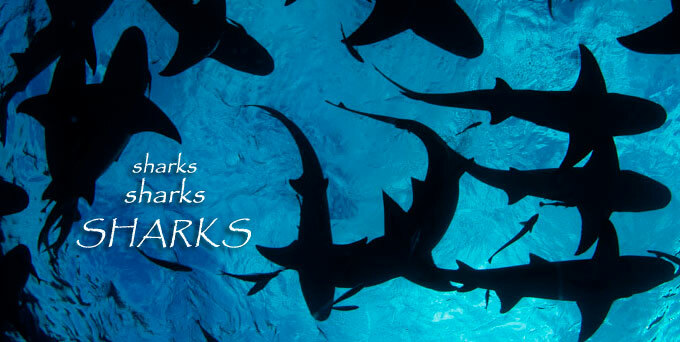 Please read our Important Shark Trip Information before considering this type of trip.